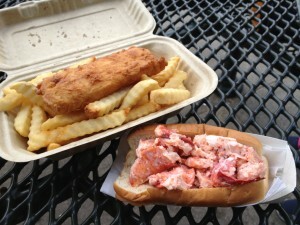 My dinner at Tony’s has only whet my appetite for fried seafood and lobster rolls. It’s funny, I’ve never been to Castle Island even though I’ve lived in Boston my whole life and went to grad school a stone’s throw away from it. I rectified that this week when Carol, Zelda and I went to explore the Island. There is a wonderful 2.25 mile loop around Pleasure Bay and after our walk we had a meal of fish and chips ($6) and a lobster roll ($10) at Sullivan’s. Sullivan is a small restaurant that has been there since 1951. 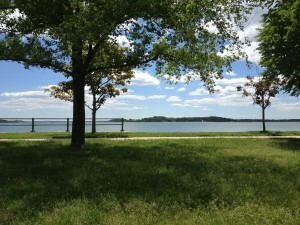 We took our cardboard boxes to a picnic table by the water and enjoyed the view. The fish was a perfectly fried piece of flaky haddock accompanied by bland crinkle cut fries. The lobster roll was mayo based, no filler and served on a buttered toast bun. The quantity was less generous than Tony’s (but also ½ the price), but the lobster seemed to be more flavorful than Tony’s. I think Sullivan’s is great - good, simple food at very reasonable prices in a perfect environment. I’m sad it took me so long to discover it. After the meal, Carol and I set up our beach chairs by the water and had a tranquil afternoon of reading and sunning.